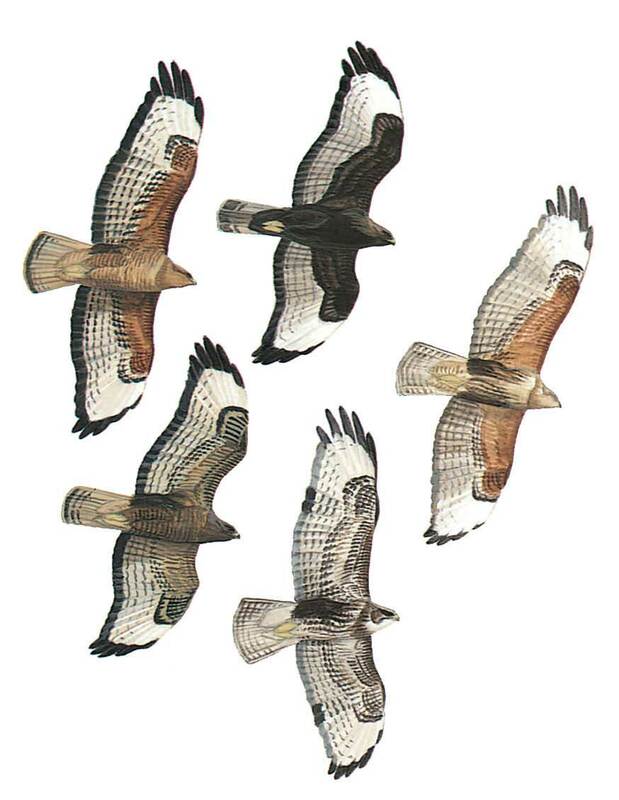 The main race that occurs in the region is the highly migratory Steppe Buzzard, B. b. vulpinus, which is slightly smaller with narrower, more pointed wings and longer tail compared with Western European birds of the race B. b. buteo, which are rare.Three types occur: fox-red, grey-brown and blackish (scarce); intermediates are frequent. Fox-red and blackish types are very similar to Long-legged Buzzard but have shorter, narrower wings, shorter tail, stiffer wing-beats and glide on flattish wings (Long-legged has flexible wing-beats and kinked gliding profile); also wings are less up-lifted when soaring. Fox-red type generally has more variegated rusty orange underwing-coverts framed by dark greater coverts, with narrow blackish comma-shaped carpal-patch (but patch can be large as in Long-legged); rufous-brown uppertail more barred (but can be plain like Long-legged), head dark and pale primary-patch above is usually small. Blackish type best told from Long-legged by flight and silhouette. Grey-brown type resembles Western European birds. Juvenile (streaked breast, diffuse band on trailing edge of underwing, no broad dark band at tip of tail) often pale-headed, with pale upperwing-coverts and prominent primary-patch above; told from Long-legged by structure. Young blackish type has fine regular barring on secondaries below and on uppertail (coarser, more irregular in similar Long-legged). Soars on raised wings and hovers when hunting.